The ultimate, no compromise work jacket. Advanced three-jackets-in-one design keeps you warm and dry in all seasons. Rely on high-tech waterproof protection, flexibility and functionality..
• Features patented MultiPockets™ convenience – two smart side pockets, perfect for a mobile phone, PDA or glasses. 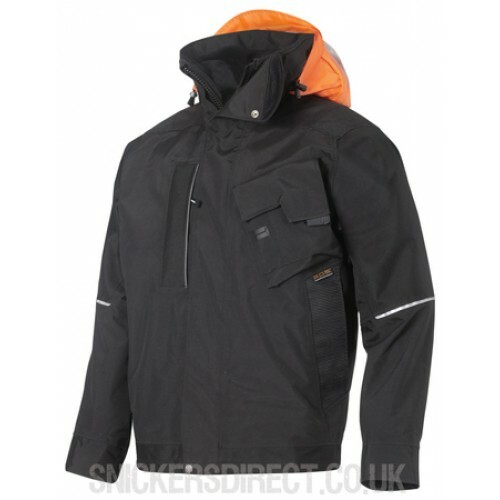 • Three jackets in one: A waterproof shell jacket, a detachable fleece jacket and, when combined, a warm winter jacket. • Superior waterproof technology – conforms to EN 343 and designed with waterproof seams that prevent moisture penetration for 100% protection. • Enhanced protection thanks to Hi-Vis coloured hood with windows for better side vision. • Reflective features woven in the fabric for enhanced visibility. • Ventilation zippers in armpits for enhanced ventilation and comfort. Material: High-technology 2-layer fabric in A.P.S.™ 100% Power Polyamide 240 g/m2, reinforced with A.P.S.™ 100% Rugged Polyester 305 g/m2 for maximum waterproof protection. 2-sided brushed fleece lining.